SAVE THE FROGS! Ghana West Africa's first nonprofit organization dedicated exclusively to amphibian conservation, and is the first international branch of USA-based nonprofit SAVE THE FROGS!. The mission of SAVE THE FROGS! Ghana is to protect Ghana's amphibian populations and to promote a society that respects and appreciates nature and wildlife. Amphibian populations worldwide have been declining at unprecedented rates, and nearly one-third of the world's amphibian species are threatened with extinction. Up to 200 species have completely disappeared in recent years. Ghana’s frogs and toads have been especially hard hit, as over 80% of Ghana’s primary rainforest has been cleared in the last century, mainly due to large-scale logging by multi-national companies and illegal clearing by villagers. Mining for gold, diamonds and bauxite has also contributed to the degradation of Ghana’s rainforests. The West African Giant Squeaker Frog, which lives in the Krokosua Forest Reserve is so endangered that only 12 individuals are known to exist. Kumasi, Ghana - 23-September-2011. An international collaboration to save Ghana’s disappearing amphibian populations is now underway, and is expected to make great strides towards protecting Ghana’s remaining wilderness areas. SAVE THE FROGS! Ghana was officially formed last week as West Africa's first nonprofit organization dedicated exclusively to amphibian conservation. The group is the first international branch of USA-based nonprofit SAVE THE FROGS!. 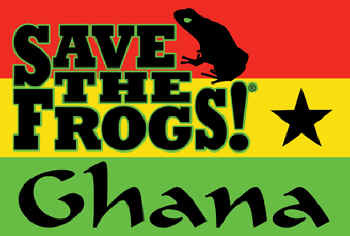 Based in Kumasi, Ghana, the mission of SAVE THE FROGS! Ghana is to protect Ghana's amphibian populations and to promote a society that respects and appreciates nature and wildlife. The group is being led by Gilbert Adum and Caleb Ofori, Ghana’s only two amphibian biologists. “SAVE THE FROGS! Ghana is the best thing that has ever happened to conservation in Ghana”, says the group’s Executive Director Gilbert Adum. SAVE THE FROGS! Ghana has created an eight-point plan for protecting Ghana’s remaining amphibian populations. Some of the group’s primary goals are educating the public, the governmental bodies and the timber and mining companies about the importance of amphibians, and instituting crucial legislation such as an Endangered Species Act, which Ghana currently lacks. The group will also be working with local and international scientists and NGO’s to create Ghana’s sixth national park by turning the unprotected Atewa Forest Range Reserve into the Atewa Hills National Park. The reserve has exceptionally high amphibian biodiversity and is home to an array of other wildlife species, but is under constantly under threat from mountaintop removal bauxite mines and unsustainable logging. The reserve is also home to the critically endangered Togo Slippery Frog, which are commonly eaten by locals. The slippery frogs are close relatives to the Goliath Frog, the world’s largest frog. To reduce the demand for frog legs and illegal logging, SAVE THE FROGS! Ghana will be training villagers in beekeeping, mushroom farming and other activities that provide alternative income and food sources. SAVE THE FROGS! Founder Dr. Kerry Kriger is in Ghana for the month of September assisting with the creation of SAVE THE FROGS! Ghana and giving presentations on frog conservation at schools, universities and government agencies, including the Kwame Nkrumah University of Science & Technology and the Forestry Research Institute of Ghana. “There are few countries in the world whose people and wildlife are so desperately in need of assistance as Ghana. Fortunately, we have an exceptionally talented young conservationists, Gilbert Adum, leading SAVE THE FROGS! Ghana”, says Dr. Kriger. “I’ve been amazed at the positive reception we’ve received from the Ghanaian people. They’re poised to help; the difference between success and failure in saving Ghana’s frogs will come down to how much support the outside world provides”. SEPTEMBER 29th, 2011, 12pm-1pm in the Auditorium of the KNUST Faculty of Renewable Natural Resources in Kumasi, Ghana. The presentation will be followed by the inaugural meeting of KNUST Chapter of SAVE THE FROGS! Ghana. SAVE THE FROGS! (www.savethefrogs.com <http://www.savethefrogs.com/> ) is America’s first and only public charity dedicated to amphibian conservation. The mission of SAVE THE FROGS! is to protect amphibian populations and to promote a society that respects and appreciates nature and wildlife.